Additional red color on black and white printing remarkably stands out. The red color effectively and attractively catches the eye. The advanced black ink delivers sharp printing and the new red ink optimized to reproduce vivid images with solid red color, for a highly attractive result. In this way, the ComColor 2150 achieves beautiful two-color printing. Delivers high-speed printing of 150 ppm*1 and startup takes a mere 5 seconds*2. This convenient model is an ideal fit for your high- volume printing jobs. 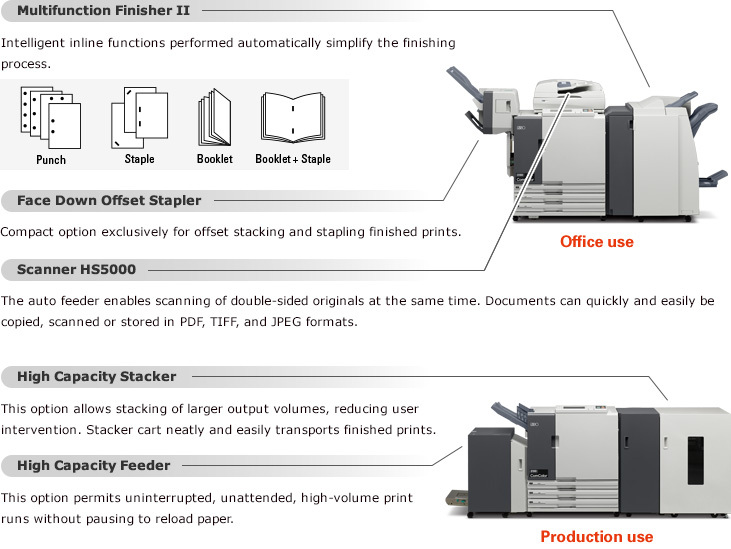 *1 A4 long-edge feed, simplex, continuous printing, plain paper (85 gsm) in standard mode (print density setting 3). Chart used: Print measurement pattern [Color measurement sample 2 (JEITA standard pattern J6)]. *2 Within 10 minutes after the last print job. Productivity-enhancing accessories automate workflow from start to finish. High-capacity feeding and stacking, and various finishing functions streamline production and eliminate the need for outsourcing. With improved performance and functions, the ComColor consistently delivers quality prints with convenience and simplicity for every user. Functions for printing, copying, scanning and managing data are at your fingertips logically arranged for intuitive operation on a large LCD touch screen. Replenishing ink is clean and easy with slim ink cartridges and the ComColor's clever design. Maximize paper capacity for high-speed printing by utilizing multiple paper trays. Unique capabilities broaden the range of paper stocks and sizes that can be reliably printed at high speeds. The ComColor, engineered for high-production environments, is built to last. Proven durability guarantees millions of prints. For direct printing even when the machine is not connected to a network, simply insert a USB flash drive into the machine’s USB slot. • The data for direct printing needed to be RISO original format (PRN format). To ensure protection of confidential documents from prying eyes, simply specify a PIN code when sending document data to the ComColor. Just enter the PIN code on the ComColor control panel to authorize printing. The ComColor minimizes ink, paper and energy consumption, while maintaining optimal print quality. 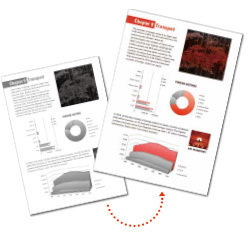 Print using one color (black or red) for a colorful effect with reduced ink consumption. Combine multiple copies of the same page, or copies of multiple pages onto a single printed page to save paper. Automatically omits blank pages in documents saving both time and paper, and further reduces running costs. • This function is only available when using printer driver. • In cases without data, header/footer included pages will not be recognized as blank pages. The ComColor is ENERGY STAR certified* and boasts many other energy-efficient functions. Power consumption when printing is just 0.15 Wh per sheet. This function is a convenient energy saver, automatically setting the printer's system power ON and OFF at desired times.